Jerk is an interesting, robust seasoning applied to meat before grilling or roasting. It’s of Caribbean origin and most often attributed to Jamaica. It’s something I’ve played around with over the years and find I like using it best with chicken. Jerk is simply a spicy marinade usually containing a large amount of allspice, garlic, and HOT scotch-bonnet peppers. The mix is blended into a dark brown paste which is then use to marinate meat. You can marinate overnight for the best flavor or as quickly as 30 minutes (especially for people like me who forget to marinate overnight). As you can imagine, the longer it marinates, the more flavor you’ll get in the finished product. I returned home empty-handed and opted to substitute Chinese five-spice in place of the allspice. I figured the mix contained enough of the warm spice and other similar flavors that it would work just fine. Although five-spice gives a milder flavor overall, it worked rather nicely (and it saved me $10). Since I’ve been addicted to one-pot/one-dish meals lately, I added a chopped sweet potato and cup of fresh pineapple to the baking dish first. I tossed the sweet potato and pineapple in a little olive oil and seasoned with salt/pepper, then topped with chicken pieces marinated in the jerk marinade. The jerk marinade should be tailored to fit your level of spiciness. Using a milder jalapeno pepper is one consideration (and the peppers are commonly found in stores, while scotch-bonnets may be harder to find). You can also de-seed and remove the white pith of the pepper to reduce its spiciness, as the heat resides in the pith and seeds. I enjoyed the jerk dinner, especially the sweet potatoes and pineapple which baked in their own juices under the chicken. I served everything over steamed rice (yes, we consume a lot of rice in our household). The color on that chicken is amazing! It looks delicious! This looks/sounds great. 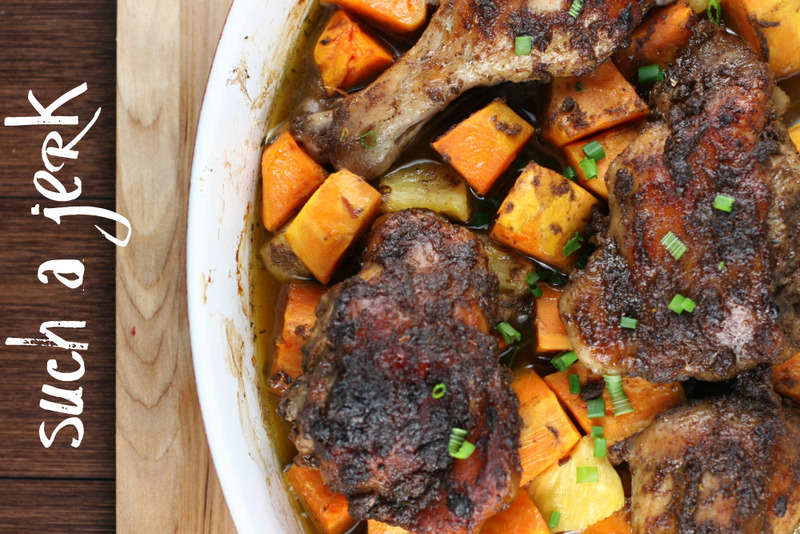 I, too, love one-pot dishes, and jerk chicken. Experimenting with spice, peppers and heat on this sounds interesting, and fun, as well. Thank you. This is really a fusion of cuisines Jamaican and Chinese! Oh my $10 for a bottle of allspice, forget it. I just had the chance to receive some allspice from Epicure and that’s good stuff. I have had jerk chicken in the past but never made it. Thanks for sharing this recipe. I’ll give it a try. Keep the casserole dishes coming, I am in the search of more recipes for Fall and Winter. Getting cold in Comox Valley so we need those comfy meals. Have a great week-end! LMAO – I can just see those housewives around you LOLOL The chicken looks fabulous, will have to try your recipe!